Bracon Ash is a village and civil parish in the South Norfolk district of Norfolk, England. The B1113 road runs through the village, which is about 6 1⁄2 miles (10 km) south of the city of Norwich. ~Wikipedia. As can be seen the building has had a few alterations since it was a store. Kelly’s 1900 Directory of Norfolk tells us that in 1900 the postmaster here was Robert Funnell. Going back a little further to the 1891 Census he was found living at ‘The Shop’, being 30 years of age and occupied as a carpenter. Remarks on the record tell us ‘Also Baker, Grocer, Postmaster’ – so a busy chap. 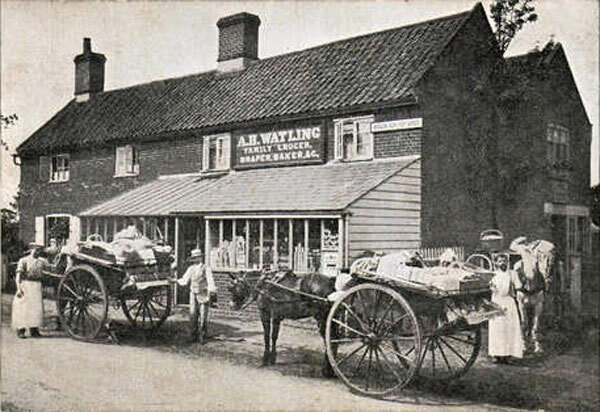 Interestingly there was a boarder, baker and employee named Arthur W(h)atling, perhaps who went on to run the store by the time this postcard was taken, if the sign is anything to go by. In 1901 Funnell is recorded as Grocer & Baker Shopkeeper Carpenter & Builder.